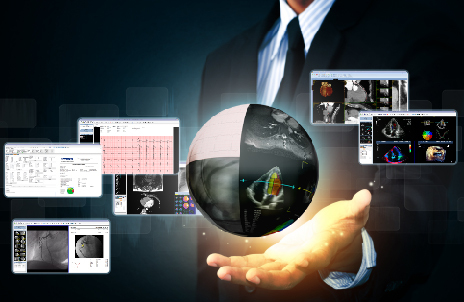 ComPACS is the one-stop-shop for image management and structured reporting for all cardiology modalities including Cath, Echo, Nuclear, CT, MRI and even ECG. ComPACS allows you to consolidate all mini-PACS’s and proprietary vendor specific solutions into one vendor neutral, multi-modality, solution for archiving, worklist distribution, image review, analysis and reporting. Within the same review station the physicians can review, analyze and report multiple image modalities from different studies for the same patient. This provides a complete clinical picture from a uniform user interface. All of the common DICOM abstract and transfer syntaxes, and Information Object Definitions (IODs) are supported by ComPACS. Furthermore ComPACS also supports and converts to DICOM multiple proprietary formats from legacy ultrasound devices : DSR-TIFF (Philips-Agilent SONOS ultrasound devices), DEFF (Philips-ATL HDI ultrasound devices) and Aloka Line Data format (Hitachi-Aloka ultrasound devices). ComPACS is capable of also storing Raw Data, fully preserving all DICOM private tags. This allows the system to be integrated with proprietary analysis packages such as Philips QLAB, Siemens eSie App or GE EchoPAC. In addition to DICOM, a growing number of ECG formats are also supported, including FDA XML, SCP and Fukuda Denshi proprietary format. ComPACS performs an automated and seamless digital conversion to DICOM, importing numerical fields and automated diagnosis.